Garrett Styles was Married with 2 Children. 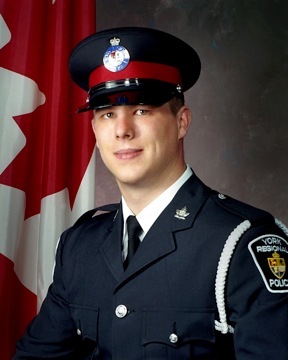 Constable Styles pulled over a 2005 Dodge Caravan with four occupants at a traffic stop on Highway 48 just south of Herald Road in the Town of East Gwillimbury. While at the side of the car investigating the driver, the vehicle accelerated and dragged Constable Styles approximately 300 metres before the vehicle lost control and rolled over, pinning him beneath it. He was rushed to Southlake Regional Health Centre by York Region EMS where he succumbed to his injuries. The 15 year old driver of the vehicle was taken to hospital with non-life threatening injuries. Three passengers in the van were not seriously injured.